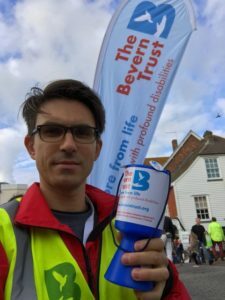 I first came across the Bevern Trust when Matthew Cornish started working there two years ago, in a newly created role of Fundraising & Development Manager. I remember being curious about this move at the time, as I had never heard of the Bevern Trust, and it seemed a real contrast to his previous role at St Catherine’s Hospice. I bumped into Matthew again recently at a Brighton Chamber event. He spoke enthusiastically about the aims of the charity, and a whole variety of ways he was starting to build awareness and develop new income. He kindly offered to show me around the project and tell me more about his work there. The Bevern Trust is based in Barcombe near Lewes in East Sussex, and provides residential care for nine young adults with profound disabilities as well as respite places. It was originally set up by a group of parents in 1999 and for several years had been running more-or-less on statutory income alone. However in 2015 the trustees and the Chief Executive realised that to secure the long term future of the Bevern Trust, a radical new approach to income generation was needed, hence the creation of a new full time development post. What were your first priorities when you joined the charity? “Branding: Although the charity was set up in 1999, there had never been any active promotion or fundraising initiatives as there was much reliance initially on statutory income. With so many well established and worthy causes in our South-East region, I began by building a thorough understanding of who we were as a charity; what is unique about us, what we do for our beneficiaries and why people should give to us. The previous logo used colours, fonts and style very much like another local charity that has a much bigger presence, and it gave no reflection of who we were. So to help us gain a foothold in this very competitive market, we wanted to create a new identity that defined us, and that people would remember, as well as transferring well across online and offline platforms. Message and strategy: When I first joined The Bevern Trust, there was a long shopping list of big items, projects and equipment, as well as the need for unrestricted gifts and regular income. It was a matter of defining what was urgent, and what we could develop as part of a longer-term fundraising strategy that would engage the community. Alongside this, my job was to clearly define our financial need, by sitting down with our accountant and working out what we must aim to raise in voluntary income each year, month, week, and then producing a strategy to achieve this goal. What you need and why you need it, are fundamental elements of your fundraising message. More recently we have positioned ourselves as a ‘Sussex Disability Charity’ which we use through our messaging as it gives a more precise geographical aspect to our cause. Managing donor information: At the heart of any well-run charity is a good, secure fundraising database. Donor information and data preference management is crucial to long-term success whilst building trust and intelligent relationships with supporters. As we walked around the project, there were some great photos on the walls and reminders of the core message of the charity, that they are, ‘Passionate about releasing people from the expectations others have about disability.’ They offer, ‘love, care, freedom and opportunity allowing profoundly disabled people and their families to get more from life’. I had also previously looked at the website, and was struck by the clear, consistent and appealing messaging about the charity’s purpose and benefit, and the variety of well worded appeals and opportunities to get involved with the work. You’ve clearly done some great work in raising awareness of the charity’s work – how did you go about this, and why is it important? “Firstly it’s about drilling down and understanding the cause. Disability is one of the most challenging causes to raise funds for. Once you have a clear idea of what practical benefit someone’s £1 will bring, you’re half way there. The second part is telling the story, and more importantly, getting others to tell it for you. Our biggest assets when it comes to profile-raising are the parents of our beneficiaries and our staff. If they are all telling the same consistent story, then that has real impact. So ensuring they have the right tools and key messages to talk about the charity’s needs confidently, is crucial. Story telling through social media and our website saw a big increase in our online presence in the first two years, and this continues to rise thanks to great photographs and current, relevant content that enhances our messages across all the main platforms. Quickly building links with the local community including businesses, churches, community groups and societies was essential. Getting in front of people by attending business networking events helped us make some excellent contacts and opened a lot of doors. Inviting potential advocates like local MPs and counsellors to the charity to meet our beneficiaries was also an important part of our profile raising. 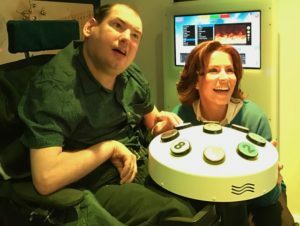 Recently, Natasha Kaplinsky, broadcaster and journalist (seen left, with Bevern resident, Paul), and Nigel Fairs, actor and musician, have agreed to become patrons to help promote the charity where they can. Clearly there is a great difference between taking on a fundraising role within a larger, well established and well known charity, and being the first fundraiser in an organisation with no track record. So what have been your biggest challenges and learning points? “Running before you can walk! There is the immediate panic to take every opportunity offered, but it doesn’t work. You must learn to say no and stay focussed on the core goals you have set yourself – whilst also being flexible and honest about what didn’t work. Managing expectations with the board of trustees and peers is vital. The biggest challenge though was validating my position. Explaining to other colleagues that the work I do today might not bring results for weeks, months or even years is tough – especially coming from a standing start as we did. What headline suggestions might you pass on to other local charities with limited resources to achieve the same results? “Your beneficiaries and their families should tell your story, bringing the cause to life consistently, through just a few key messages to keep up their sleeve – they are your biggest asset. Stay focussed, you will be awash with other people’s fundraising ideas – most of which you must say no to and stick to your plan – but be flexible where it counts. Be realistic about what you can achieve in the time you have. There are only so many hours in the day, so I recommend having three columns to your fundraising plan; Urgent (business critical), Medium Term (what could give you a return in 6-12 months) and Long Term (projects and contacts that will give you a return in 1-2 years. What this case study also demonstrates to me is the importance of Trustees investing in skills and resourcing in order to address their future funding needs. It was a bold decision to create a new full-time post, but one which is clearly bringing some great results. Matthew on duty in Lewes!